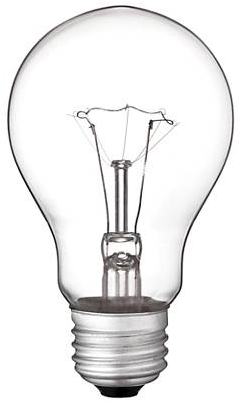 Traditionally the majority of light bulbs were incandescent Light Bulbs. The term incandescent refers to the general term for light emissions driven by heat which includes the simple case of black body radiation. These bulbs have a thin wire filament through which current passes and causes the filament to heat up and very quickly radiate light. The filament is encased in a glass container which has no oxygen and as a result prevents the wire from oxidising and being destroyed. This type of bulb produces light but also produces a high proportion of heat which makes incandescent bulbs inefficient from an energy efficiency perspective. Conversely where heat and light is necessary, for example in incubation units for poultry or reptile boxes, this light bulb technology is a good solution. Incandescent light bulbs are cheap to manufacture and do not need any external electrical control equipment which has contributed to their widespread adoption. In simple terms the CFL is a compact version of the traditional strip lights which are commonly used in commercial premises, garages and in domestic environments where light efficiency is more significant than the aesthetic appearance. If you take a look inside a CFL energy saving light bulbs it has the following constituents : there is the electronic starter which is often called the ballast and the tube element which is filled with gas. The gas which contains mercury vapour is energised by an electrical current, which has the consequential effect of emitting ultraviolet light. This the causes a reaction with the phosphor coating inside the tube which then caused it to emit light. 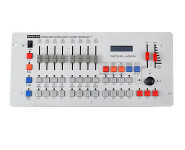 Electronic ballasts have a miniature circuit board containing rectifiers with a capacitor and normally a couple of transistors for switching which are connected to form a high frequency alternating current inverter. A high frequency is then emitted, usually 40 plus kHz, which is connected to the lamp tube. Because the resonant converter stabilises the lamp current and corresponding light output throughout the scale of applied voltages, normal CFLs cannot operate in dimming modes and as a consequence special electronics is needed for dimmable CFLs. Old technology CFLs flicker on start-up due to their primitive magnetic ballasts but CFLs with new electronic ballast technology rectify this problem. Fluorescent lights are available in two types, the integrated or non-integrated type. The non integrated type has a separate electronic ballast, called a starter, and in the integrated version the ballast and tube are a single combined unit which is attached by either an Edison screw or bayonet fitting to form the bulb. 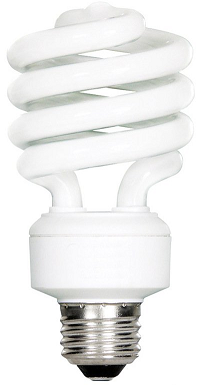 By designing the CFL in this manner it can be used as a direct replacement for the traditional incandescent light bulb. The first generation CFLs flickered when switched on due to the fact that there was a delay of a few seconds before the ballast operated correctly and exited the gas inside the tube. With more modern technology compact fluorescent bulbs, this process is accelerated and accordingly there is typically less than 1 second of flicker. However, one disadvantage is that these bulbs do need a small amount of time to reach effective operational conditions and for full brightness to be reached, so accordingly low quality CFLs are dim when initially turned on. For this reason it is often best to use compact fluorescent bulbs in fixtures that are left on for prolonged periods of time, as opposed to fixtures that will turned on and off regularly. The average rated life of a CFL is between 8 and 15 times that of incandescent lamps giving them a lifespan around 6000-15000 hours. Halogen bulbs have similarities to an incandescent lamp in that a tungsten filament is sealed within a compact transparent container which is filled with an inert gas together with a small quantity of a halogen chemical element for instance iodine or bromine. The tungsten filament within the halogen gas combines together producing a chemical reaction known as the halogen cycle which increases the lifetime of the bulb and in addition prevents its darkening by repositioning tungsten from the inside of the bulb back onto the filament. 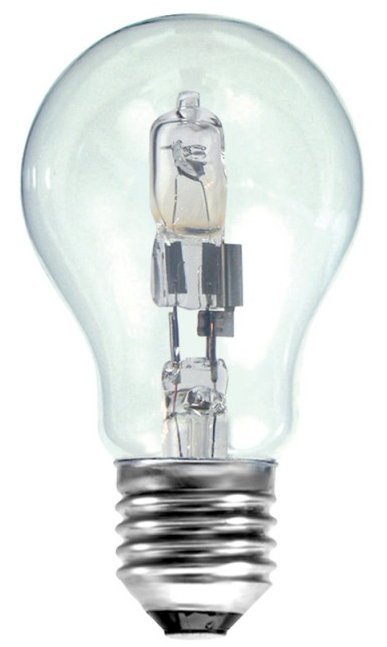 One key factor in the quality of the bulb is the fill gas additive used which can be argon, krypton or xenon. The best technology is xenon as this gives a fast start up reaching 80% of brightness in a few seconds, a longer life and a good warm white light colour. The halogen light bulb operates at a higher temperature than a conventional incandescent bulb giving it a higher efficiency and typically realising a 30% reduction in energy operating costs. The halogen lamp will emit a wide spectrum of light, in a similar manner to standard incandescent technology light bulbs, through the range from close to ultraviolet right through the infrared spectrum. One effect of the lamp filament operating at a temperature higher than a traditional incandescent lamp, is that the spectrum is migrated toward blue, which means that the resultant light has a higher colour temperature. The halogen lights higher colour temperature gives a blue light colour which is characteristic of the halogen lamp as opposed to a traditional incandescent bulbs which produces light with a characteristic yellow colour containing shades of red and white. Another manufacturing feature of the halogen bulb technology is the ability to produce a bulb of small dimensions which means the bulbs are particularly suited for precision applications and universally adopted for car headlights. Another spin off benefit of halogen bulb technology is that they operate well with dimmer switches to reduce light levels and energy consumption. Typical life-spans for halogen bulbs would be around 2000 hours for a 28 Watt bulb but a reduced figure of 1000 hours for a 18 Watt bulb. 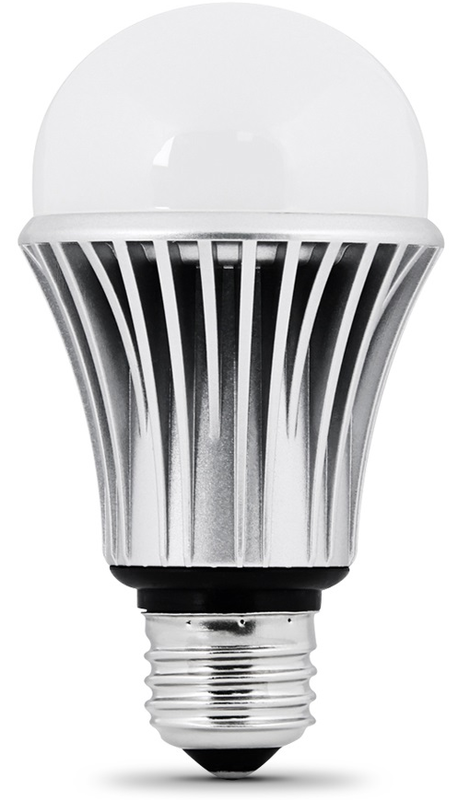 LED bulbs use a semiconductor technology and were originally just used for indicator lamps emitting a low intensity red light. Technology advancement now mean that LED's can be made which emit light with high brightness across the visible, ultraviolet and infrared spectrums. To switch an LED on the diode is forward biased which means that electrons are forced to recombine with holes within the device having the effect of releasing energy in the form of photons. This phenomena is known as electroluminescence and the colour of the light emitted which corresponds to the energy of the photon is determined by the energy gap of the semiconductor. A LED usually has a small area, typically less than 1 mm2, and the LED contains integrated optical lenses which are used are used to shape the radiation pattern and aid with reflection to produce an effective light beam. 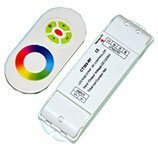 There are many advantages of LEDs over incandescent light sources including lower energy consumption, longer lifetime and improved robustness. However, the initial cost of these bulbs traditionally was considerably higher than incandescent bulbs but has now reduced with the advancement in technology and production methods. Although the initial cost outlay is still higher the full lifetime savings are considerable. The typical lifespan of a LED bulb would be around 50,000 hours about 50 times the lifespan of a traditional incandescent bulb. This not only makes the use of LED's cost effective but also has environmental benefits by reducing landfill and because LED's do not contain any hazardous waste. The LED itself has also advanced over recent years. The early LEDs were all surface mount devices (SMD). These were then superseded in the top end ranges by high powered LEDs which have their own lens for each LED. The most recent and advanced form is now the chip on board (COB) LED. This is characterised by its appearance which is like a large yellow dot when unlit which then glows white when energised with electricity.